Running is a sport that doesn’t require much spending to get started! One can get on the road with a pair of shoes, shirt, and shorts (socks optional). This is a good thing because many people who are looking to go from couch to 5k have enough to deal with building the courage and motivation to get out of the door! All this said, runners LOVE their gear! New runners and experienced runners alike can lose themselves with the wide selection of gear, gizmos and gadgets that are available to them! In my opinion one of the better purchases a runner can make is a GPS watch. Before I got my first Garmin, I was using the old Nike+ foot pod system. It was great for what it was, but nothing beats the accuracy and function of a GPS watch. I was overwhelmed with my first 2 GPS watches, the Garmin 301 and the Garmin 205, but I managed to focus on the features I needed and ignore the ones that I didn’t. 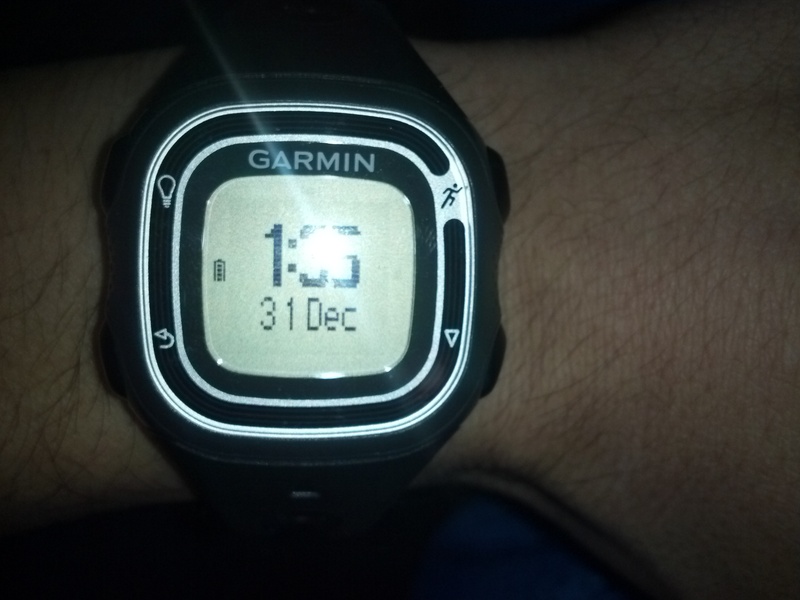 At long last, this brings me to the Garmin Forerunner 10. At about $129, The Garmin 10 is a budget friendly, simple to use GPS watch. 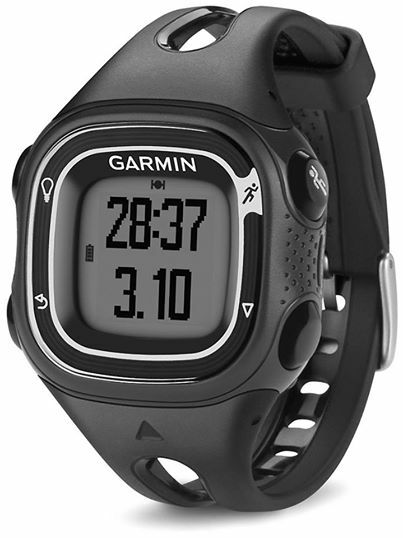 Definitely on the lower end of the price spectrum compared to other Garmin offerings such as the new $399 Garmin 620. But what do you actually get for your money? And will it be worth while for you? I personally don’t require a ton of features, but there were things I really liked about this watch and others that were left to be desired. Quick connection to GPS Satellites – I have not had any issues connecting to any GPS satellites. Compared to previous models I’ve used where I had to leave my watch out for at least a few minutes to grab the signal, the Garmin 10 picks up the satellites in a snap! Accuracy – This kind of ties in with my first like. Once the signal is locked its pretty accurate and I have not had this watch drop signal on me unless of course I go in-doors. Size/Comfort – I like that this watch is small, what I like even more is that it’s comfortable! I have a pretty small wrist so its perfect for me! I have the Black/Silver Garmin 10 which is 0.81” x 0.77”, however Garmin offers both Orange/Black & Black/Red slightly larger at 0.98” x 0.94”. I can keep this watch on all day without bugging me! Wrist watch functionality – A huge perk about this watch (and other recent Garmin models) is that it also functions as a stand alone wrist watch. Meaning you can keep it on your wrist all day! The Garmin 10 is so small and unassuming that it actually functions well in this role without looking awkward! Simplicity – Even though the Garmin 10 has the least options/functions of all current Garmin models, this aids in one of its perks… simplicity! The 4 button layout works surprisingly well and is extremely fast and easy to pick up on. Button 1 is the Power On/Off button (a feature I’ve yet to use) and also turns on the back light w/ a short press. Button 2 turns on the GPS, selects menu options/functions, start/pause, etc. Button 3 is simply a back button, which also serves as a manual lap/split button (when the feature is turned on). Finally, button 4 is used to scroll through menu options, and change display during the run between 3 screens: Time & Date, Run Time & Distance, Calories & Pace. Simple and easy! Pause Display/Mile Feedback – Ahh its the small things that I can appreciate! When the Garmin 10 is paused it scrolls through stats related to your current run: Time, Distance, Average Pace, etc. On the same note mile splits are displayed on the watch after each mile! Its just so convenient and a good way to check to see if you are on target with your workout! Charging Limitations – As far as I could tell, the only way to charge the Garmin 10 is by using its nifty USB cradle and plugging it in your computer. This works well for me as I like to sync my runs and post them to Daily Mile, but I can think about other situations where this limitation would be a problem. The Ragnar Relay, for example, where you are running multiple times in a day, etc. I’ve never seen this limitation with any previous Garmin’s so why start now? Timing Out – What do I mean by timing out? Well, lets say you are going for a run up a hilly trail. You may want to pause your watch to stop and admire the scenery when you get to the top! You may even want to take a picture with your running buddies. Well during this time its likely that the Garmin 10 will time itself out. On the plus side, it auto-saves your workout. But its just annoying! I don’t like to split up my run if I don’t have to, that makes me have to post multiple runs and explain how they’re all part of one big run… annoying! No Elevation Displayed on Watch – This may just be nit-picking for some but sometimes I want to know what my elevation gain was after that intense hill. You cannot view this information on the Garmin 10. You can however sync your watch with Garmin Connect and get your elevation stats. However if viewing elevation changes on the fly is important to you, look for another model. Virtual Pacer™ compares current pace to target – *Update* I tested the Virtual Pacer™ feature on a recent run and it works pretty well. Aside from alarm alerts to tell me when I was on pace, behind, or ahead of pace, there was also a custom view on the Garmin which displays this info for you, including your current pace. It did effectively keep me on my target pace, however I have a couple of gripes. #1. I can set a target pace, however, I am not able to set the thresh-hold as to when I am notified that I am running either too fast or too slow. #2. With the already limited active battery life of the Garmin 10, I suspect the Virtual Pacer™ feature would shorten it even further with all of the alerts through the course of a long run, although I ran some hills when I tried this so maybe my pace was jumping around more than usual. Run/Walk feature with planned breaks – *Update* I don’t expect to use this feature, but after using the Virtual Pacer™ and some of the other notification features available on this watch, I can gather an idea of how it works. If anyone does use this feature, or thinks it would be beneficial to them, I’d love to hear your thoughts! With the Garmin Forerunner 10 (and its $129 pricetag) you get a lot of bang for your buck! The watch combines a strong GPS, with style, simplicity, easy to use functions and thoughtful features. It does all of the basic stuff very well! Also, it is easily the most comfortable GPS watch I’ve had the pleasure of wearing and it also works well as an every day wrist watch! The Garmin 10 though, is not for everyone. Those who need more features and functions out of their watch: Tri-Athletes and Ultra-Marathoners etc. should look elsewhere, as well as runners who want real time elevation feedback. In addition, because of its relatively short functional battery life, it may not be suited for runners who expect to be on the road or trails for 5 hours or more. Have you used the Garmin Forerunner 10? Have it on your wish list? Prefer a different model? I’d love to hear from you! Leave a message in the comments section below!